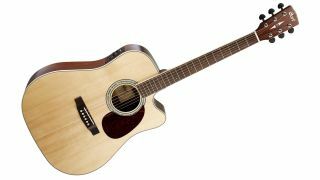 Cort continues its run of new acoustic guitars for 2016 with the MR710F-MD - a dreadnought with Madagascar rosewood back and sides. While the rosewood promises a character similar to Brazilian rosewood, the MR710F's solid Sitka spruce top provides versatility, and a Venetian cutaway offers easy upper-fret access. As well as a genuine bone nut and saddle, and 20-fret rosewood fingerboard with 25.3" scale, the MR710F is equipped with Fishman's Sonicore pickup and Presys preamp, packing a three-band EQ, tuner and phase control. Finally, Cort's scooped surface bridge enhances sustain courtesy of a greater string angle from the saddle to the body, which also reduces tension on strings across the neck.